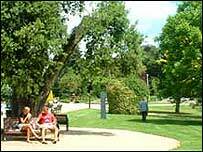 More than two dozen parks and green spaces in the West Midlands have won awards for the way they are run. Some 23 Green Flags, which are a national benchmark for quality, were given out in the region. A flag is awarded to spaces that are welcoming, safe and well-maintained with a strong community involvement. Green Flag winner Jephson Gardens and Mill Gardens in Leamington Spa, Warwickshire was also given Green Heritage Accreditation. The Green Flag scheme, which is run by the Civic Trust, was introduced 10 years ago and was inspired by the Blue Flag scheme for clean beaches. To qualify parks and green spaces must be freely accessible to the public and have paid regard to sustainability, conservation and heritage. The 26 winners in the West Midlands were part of a record 423 awards given out across England and Wales. Three other spaces in the region were given Green Pennants, which are awarded to community-run schemes. Paul Todd, the Green Flag Award scheme's manager, said: "As a charity concerned with urban renaissance, the Civic Trust is delighted to once again announce a huge growth in winners, highlighting the importance quality green spaces play in our communities." The 10th anniversary of the scheme will be marked with a ceremony at Birmingham's International Convention Centre on Thursday 3 August.